Helicopter Flying -- Yet another distraction. In the spring of 2008 Lee gave me a block of helicopter lessons. She has been the encouragement for many an endeavor that has resulted in large expense, and rewarding interest, over the years. The lessons started with C&R Helicopters in Nashua, NH. I trained in the venerable Robinson R22. I think of myself as a competent fixed wing pilot. It took some concentration and effort to elevate my flying to the point of being comfortable with the Glasair. Forget all that. Flying helicopters is the single most difficult coordination skill I have ever attempted. Every major appendage is actively engaged in keeping the beast in the air. To an observer it may look like the machine is in a boring, stable hover. To the pilot it is a non-stop effort that requires supreme concentration and effort. Not a single millisecond of lapse in attention is allowed or the ultimate consequence will be paid. And the COST!!! I am convinced that these things are held in the air by pouring $100 bills into the tank and bits. Mechanically they are far more stressed than fixed-wing craft. Thousands of parts have to be perfect, balanced, and functioning in harmony to keep these unnatural things aloft. Whereas an airplane has the close analogue to a bird, there is no such model for a helicopter. It is a conception of man, and as such lacks the grace or elegance of nature. Still, I am fascinated. It is a new skill to master. A new realm to explore. Compared to fixed wing flight, the first liftoff into a 10 foot hover is far closer to that childhood fantasy of flight where you lift off and swoop around. The visibility is stunning and the sensations could easily become addictive. These are a few photos from a training flight to my front yard at the old house. From the ground it looks plenty big for helicopter operations, but the acceleration run to ETL out the front kind of showed that it's a little cramped. The fence line and power lines are not really as close as they look in the photos, but the wind would have to be just right since the approach and exit would have to be made in the same direction. I am sure the neighbors would have more to say if I made a regular habit of this. I will be the first to admit that buying and owning a helicopter, especially when I already have plenty of other toys and projects, makes absolutely no sense. But somehow these awful contraptions have gotten under my skin. Across from my hangar in Fitchburg is Steve Brousseau's hangar. I used to work with Steve, and ran into him again a few years ago when I moved hangars. He has not one, but two absolutely pristine Bell 47's in there. On weekends he is usually out tinkering with them - and the tinkering is endless as far as I can tell. Now a Bell 47 is not the prettiest thing in the world. Aerodynamics were not a large element of the equation when they were designed. They are strictly functional in appearance. EVERYTHING is exposed an out there for all to see - a lot of mechanical elements plain as day. However, if you ever wanted to get a real sense for how helicopters work and all the elements involved, get up close and really stare at a Bell 47. The mechanical elegance shines where the aesthetics do not. It does not seem so daunting, and actually starts to become, well, beautiful. Models: Of course being a homebuilt guy, certified ships are not for me. 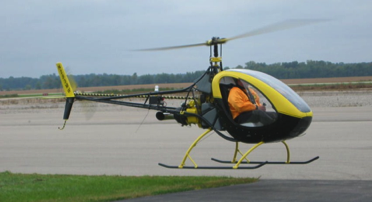 Robinsons R22's, Hughes 300's, Enstroms, Brantlys, they all are out there and some are even affordable, but being drawn to the mechanicals elegance and challenge of the helicopter idea is part of the attraction. I would not want to get back in the cycle of having to spend a fortune for someone else to do all the work, when working on them is part of the attraction. There are two models of homebuilt that appeal to me: The Rotorway EXEC 162F, and the Helicycle. Both are very different, and that is a dilemma. Marginally powered - esp. two-up. Beautiful - nicest looking helicopter out there! You can find a lot of information about either on the web, but the web is the web. There are a tremendous number of opinions out there. Especially about the Rotorway. The Internet being a mouthpiece for anyone with an opinion, I have found that usually folks with negative opinions are more vocal than those that are content - and therefore it's easy to gain a negative impression. This is especially true with Rotorway. You can find a ton of folks bashing it for anything from the maintenance load, to being underpowered, to the tail rotor belt system. After all, the design has been out there 20+ years. Its faults and strengths are well known. I decided to find owners of each to get true opinions from folks who should know. In Nashua, NH, I found Ray Grenier. He is a Rotorway builder, former Rotorway pilot, and a Rotorway fan. He also crashed his helicopter and sold it for scrap. From what can be surmised, he lost tension in his tailrotor belts, which reduced the authority, causing him to spin. He couldn't hold it straight on the landing attempt and placed it down while still rotating, and the inevitable rollover occurred. His observation was that a simple tach on the tailrotor would have alerted him to the slippage well before it got beyond the ability to control. Perhaps his best nugget of knowledge was that any helicopter less than an R44-sized machine is a toy. Regard it as such and set your expectations accordingly. Ray pointed me toward another gentleman named Bob Donadio, who bought a kit with Ray, mounted it on the gear, then never touched the kit again. It had been sitting idle for 6 years. I called the factory and learned about things that would have to be looked at after sitting for so long. I also priced out the COG belt option and the Talon landing gear. Although I didn't negotiate with Bob, my feeling was that I could get the kit and the options from Rotorway for probably around $45K total . Of course the scary bit was that RW recommended a borescope to determine if the cylinders were clean. They dyno run them at the factory, then seal all plugs and openings, but do not pickle them, so it would require a full checkout. Elastomerics and belts were beyond time limits, and the plexi and fiberglass hadn't been stored flat cleanly. There was stuff stacked on it, so warpage would be an issue. The closest Helicycle kit to me was in Northboro, MA. Jim Flanders owned the kit and I tracked him down and made contact. He, too, was more than hospitable and invited me down to take a look. He also let me know that HIS kit was also for sale. Purchased about a year ago, Jim mounted the frame on the gear, then never touched it again (a familiar pattern, apparently). Honest. I was just going down to look at the kit. Jim and I discussed the value and he indicated that he would be open to sell it. SO I BOUGHT IT! It was a deal I couldn't refuse.